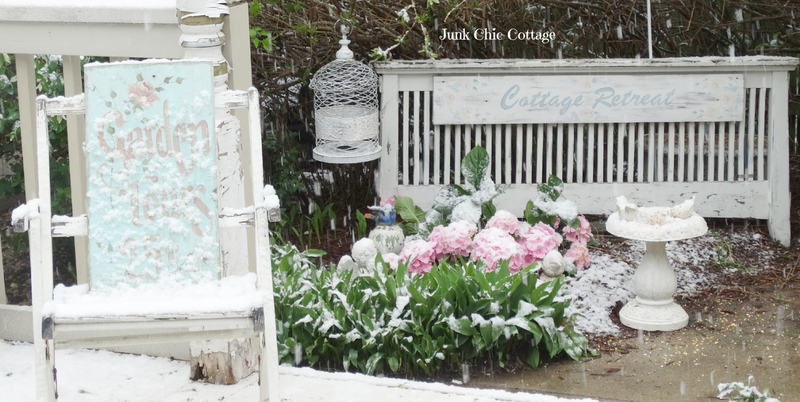 Junk Chic Cottage: Garden Tour Anyone?!!!!!!!! Why do I live in the Midwest? It is the middle of May and this is what I woke up too this morning. This is ridiculous to say the least. After getting my planting done this week you know when the temps were in the 80's this is what happened today. I am just sick about this. I have to get my planting done before we leave for a 10 day vacation on Saturday because if I waited until we get home after Memorial day everything is picked over up here for flowers. This is how my dining room looks now! I was out in my pj's and slippers bringing in the flowers from the deck. Yep out in my slippers and pj's hauling in the hanging baskets and planted boxes. Even Libby is looking out the window in pure discuss. 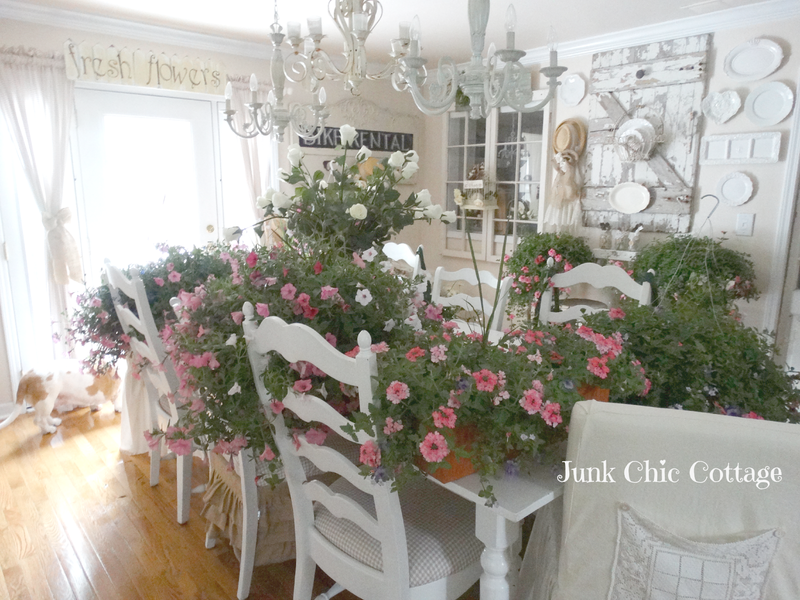 That Fresh Flowers sign above the french doors is suppose to mean out on the deck not in the dining room Ughhh! 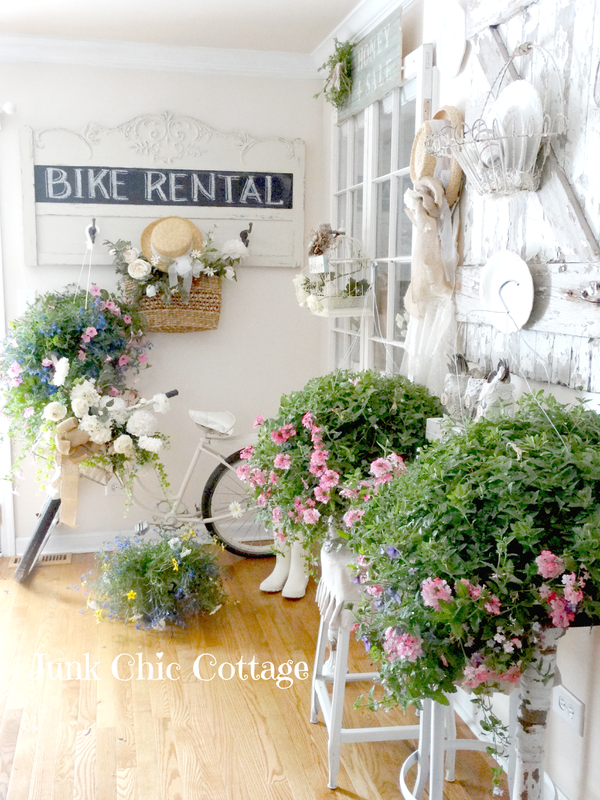 So do you like the new decor at Junk Chic Cottage! Pulled in as much as I could from out front!!! Even the birds are shaking their heads. I think the birds like all the rest of us in the midwest need to roll with it! Look at the little guy being smart and staying under the bird feeder out of the snow. Tomorrow I am headed to Florida where it is 90!!!! So over this stuff. I hope where you are today you are not dealing with this mess. Hi Kris, wow this weather is so crazy all over the place! I hope it warms up and changes soon. Your poor flowers are at least safe in the house! Lol! I am still wearing sweatshirts inside the house and I want sunshine and warm weather too. Have a wonderful trip where ever you go and a nice weekend. This is too crazy!!!! The sun is out and it is warming up so I hope to move everything back outside later. They are saying it will warm up this week to the 70's and 80's so I hope that is true while I am gone. Yikes!!!! Ha Ha Linda I have a few nice ones in my dining room you could come and get LOL! Oh Amy Jo I am so excited to get on that plane tomorrow and head to Florida. I want to partake in your sun and heat for a few days. I cannot wait. It is so crazy to have snow in May! My facebook page is full of video' and photos of the snow from my old neighbors in Illinois. This is too crazy!!!! It has stopped snowing and the sun is out and warming up again. Hope to move the plants back outside later. It was wild to wake up and open up the blinds and see that snow coming down. It was in the 80's a few days ago. Just too nutty. I have been seeing people post about the snow on facebook today and just couldn't believe it...I'm so sorry that y'all are having this winter weather in mid May. Down here on the Alabama gulf coast, we have had two nights in the 40's and that is unreal for us in mid May. We are having a HUGE music festival on the beach this weekend and those kids better have a jacket:) Have fun in Florida! YIKES my friend, thankfully you have so many hanging baskets and containers that weren't planted in the ground and could be brought it. 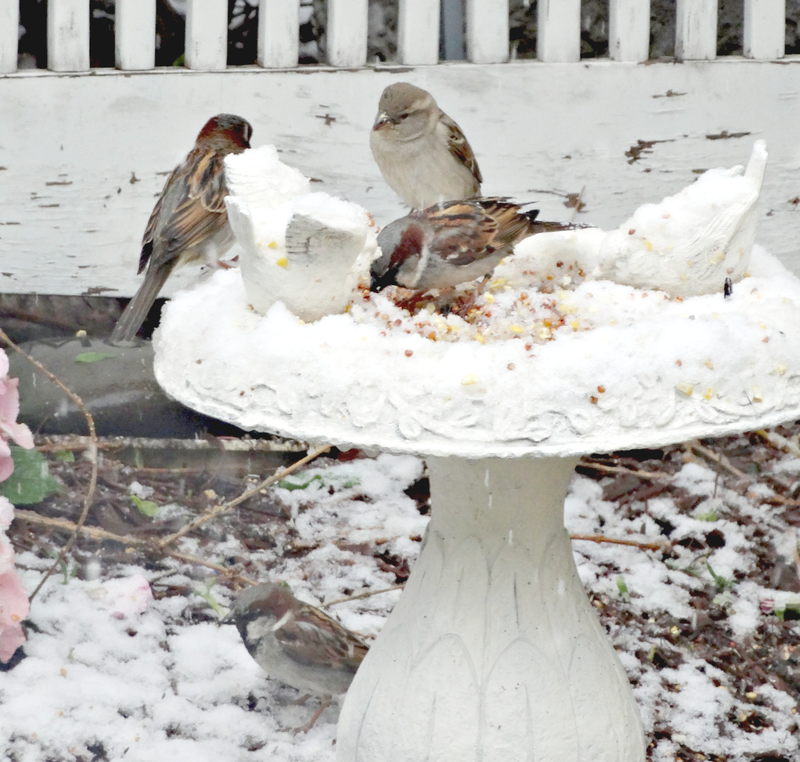 Your birdbath pictures are cute but wow do the birds look confused! Yikes is right. OMG! This is too crazy for me anymore. I cannot wait to get on that plane tomorrow to head to Florida. Yep the birds are looking a bit confused too. That little one under the feeder is the only smart one LOL! It is sunny out now and the snow is melted and it is warming up so I hope to get the flowers back outdoors later today. I think I need to change the Fresh Flowers sign to Winter Wonderland and have that up year around! This is too crazy. Oh my goodness! I awoke to cooler temperatures as well Kris. As I type this it is 68 ands breezy. I have all the windows opened. Come on down . We in North Central Florida will it be making 90's this week, hut it is better than a freaky May snow. Wow, that is so crazy!!! Looks so pretty in your house with all that color!! We have the same, 87 yesterday and 50 today, lotsa rain but no snow. I never get plants till after Memorial Day, its the Northeast, not dependable for the weather. Enjoy your vaca!!! 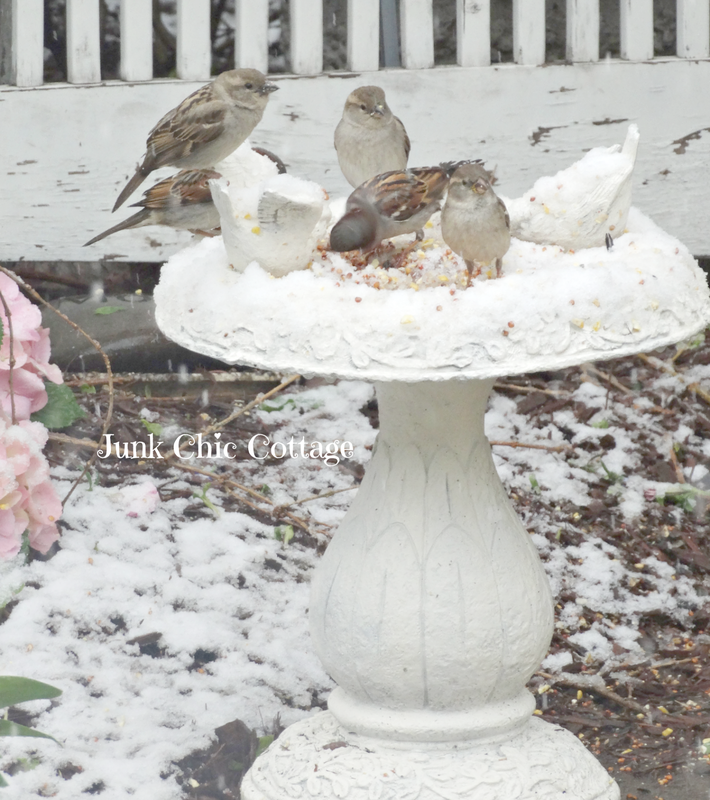 It is warming back up and the sun is out and snow gone so I hope I can move them back outside this afternoon. Then the girl that is staying with our dog will be able to water them OUTSIDE next week. Too crazy. We have the same problem Kris. I pulled out all my garden furniture, put up the gazebo roof, sowed tomatoes, salads etc. The day after, it was hailing, windy, rainy, just name it. Well, enjoy your vacay and don't forget to share your days. OMG Where do you live!!! Well you are in Florida today and as you know it is sunny and gorgeous today in Orlando! Your house is adorable love all of the flowers! We live in the Northern Suburbs of Chicago. At least the sun came out and it is warming up some. Hoping to move the flowers back out into the yard this afternoon. I will be very excited to get on the plane tomorrow for warm Florida. What a surprise that must of been to look outside and see snow late in May!! Thank goodness it won't snow in Florida. It is cold here in Ohio today and I can't wait until we leave next week to the hills of Tennessee...heard it is a lot warmer down there. Yep, this weather is crazy. We had hail a few days ago. Now, the heats back on. Bleh! Your place looks beautiful, as always. OMG Kris! What will you do with all of them while you are gone? It would be a shame to lose any of those gorgeous flowers! Hope you have a great trip. It was 99 here for the past two days. Crazy hot for us and crazy cold for you! The flowers look so pretty in your house! Have fun in Florida. Kris, you should be coming to HOT sunny CA where it has been in the 100's most of the week. Hope you have a wonderful vacation and the weather is terrific. Sorry that you had snow. Stop by and see my April flowers and Garden Tour. so sorry, kris, but, the flowers are gorgeous! we've had hail off and on all day today:( have a fun time in florida! shudder! I'm so glad you were able to save your flowers! the poor birds... hope it clears up fast! OH no...it was cold here, but not THAT cold. Looks pretty in your house, though! Hope that weather passes SOON. Can't believe this! Oh my! However, the inside is full of color and probably smells really good. That's one way to bring the outdoor in. lol. At least you were able to save the plants, pj's and all. Well, sweetie...I have to admit the flowers make for a great photo shoot! Ha! But I feel for you...I was devastated that I ran out of time and didn't get to my flowers before we are scheduled to leave for 2 weeks on Sunday. I guess that worked out for the best... but things DO get picked over very fast in our area. Everyone runs out like mad when it gets warm. I hope I get a few good things when we get back. I've been busy and am so sorry I haven't been by recently. Where are you going on your trip? What the heck??? SNOW? Are you kidding me? That's just crazy for the middle of May, I'll never complain about the weather again, it's in the 80's here! I must say those flowers look gorgeous all over the house though! Have fun on your vacation Kris, and enjoy the sunshine! This is really crazy! I'm sorry, Kris. That's no fun at all. 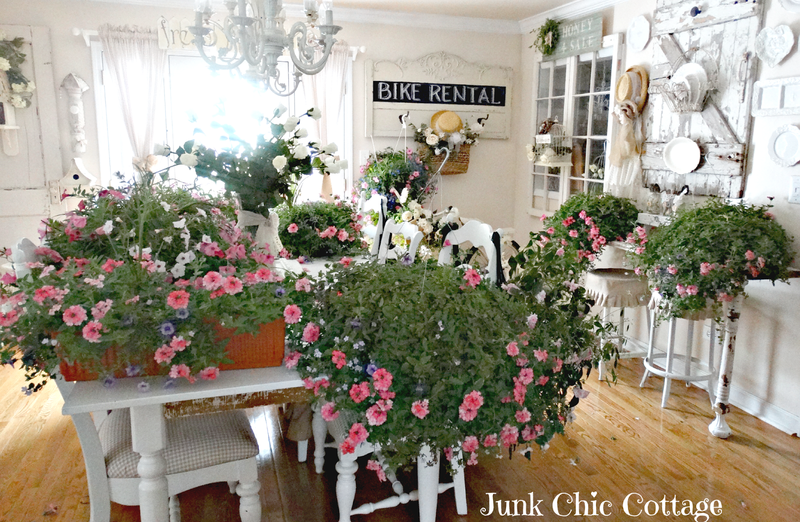 Your home looks like a flower shop. Very pretty :). Hopefully the cold snap will be gone soon. I expect snow here in May, but where you live?!? Unbelievable. Gorgeous, gorgeous plants... hopefully the snow will melt quickly and everything will be fine. We got another 6" with temps in the 30s this week, but after the snow melted the plants that were coming up looked even better. Who knew, you know? So sorry about your lousy weather! So glad you were able to get the plants in though. Enjoy your time in the sun, and try again when you get back. You did a great job of rescuing you flowers. I hope they survive while you are in Florida. I would cry if I saw snow outside in May! But I will say your home does look like a florist shop...I bet it has a lovely scent as well. Enjoy your time away where there will definitely be NO SNOW! Oh..the weather is crazy! However the inside looks marvellous and so fresh wtih all the flowers. Don't even get me started...and I won't repeat the words I said as I looked out our window.You could not be leaving at a better time! I know you will have so much fun,can't wait to hear all about it when you get back.Last night I had to over up all of our plants because of the frost! 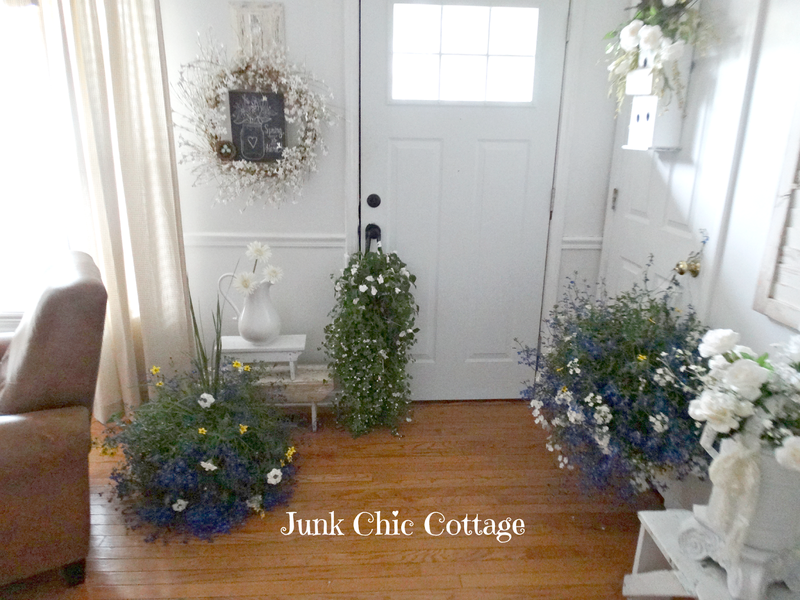 Oh Kris, your front yard, and porch looked so cute with all of the flowers everywhere!! 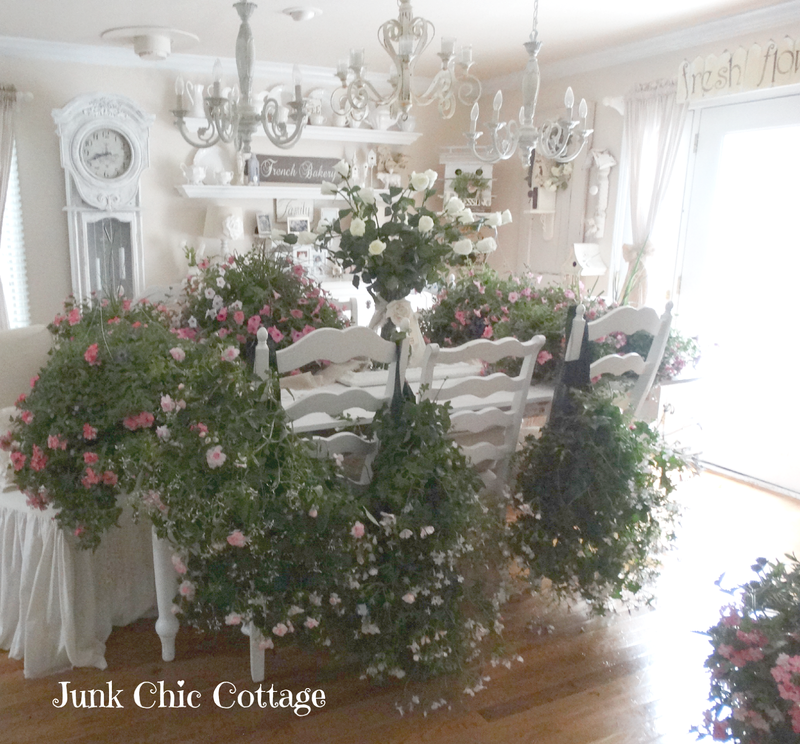 LOVE what you did with the vintage pieces, and how you mixed them in with the gorgeous flower arrangements! So sorry you had to move it all inside. Mine is all in the garage...grrrrr. I'll be moving it out again tomorrow. We'll see how long it stays outside this time. Have fun on your vacation, sweetie. Oh my goodness...I am laughing....wasn't the weather crazy this Spring? But I must say those flowers, a lot as they may be, looked beautiful everywhere!